The Baltic states are not on the art map for American and Western European travelers, but perhaps they should be. Especially Riga, the capital of Latvia, which boasts a beautifully preserved historic city and some of the best Art Nouveaux architecture in the world. The image below, with an elongated head motif, is from Riga's most photographed building, which was designed by Mikhail Eisenstein, father of the famed director. Riga also a number of museums. The main one was closed during my last visit, a week ago, but I found it more of a curio on an earlier trip: three centuries of Latvian artists painting in international styles, but only a handful of standouts (such as the constructivist, Gustav Klutsis and the modernist, Voldemārs Matvejs). This trip took me to the Art Museum Riga Bourse, which was well worth a visit. Situated in a gorgeously restored building in the heart of old Riga, the collection includes some impressive minor works from past centuries of Latvian art, as well small collections from East Asia and Egypt. It also has a grand hall, rich with classical detailing, for temporary exhibitions. I was lucky to catch a show called "Four Moving Poems" by Lech Majewski. 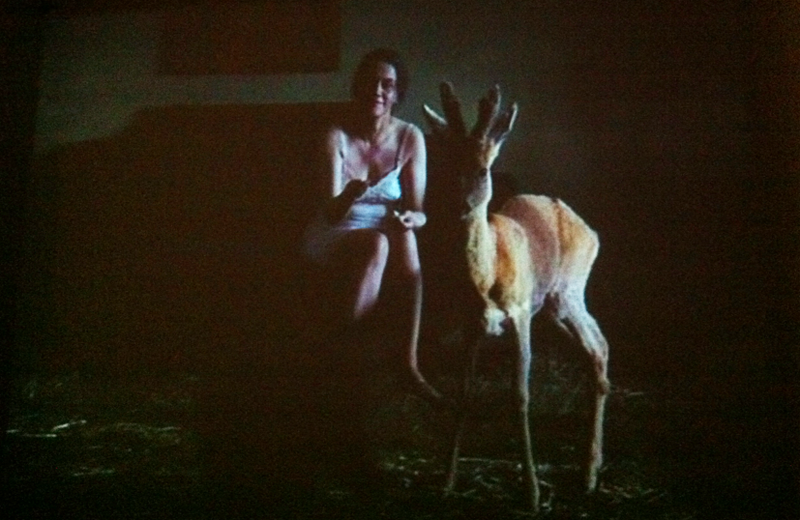 Majewski is a Polish artist and filmmaker. He gained initial fame internationally when he wrote the screenplay for Basquiat. Two years ago, he released a stunning feature called The Mill and the Cross. Seek it out if you missed it. The film painstakingly reconstructs Bruegel's painting, The Procession to Calvary. Using an innovative technique that sets several layers of live-action film against a painted backdrop, Majewski manages to bring Breugel's masterpiece to life. More than that, he enters into the painting, creating narratives about various characters who appear as anonymous miniature figures in the original painting. The film is a technical triumph, but it also does much to capture the mood of the time. We learn, for example, that Flanders had been conquered by Spain, and the red robed horse riders in the painting are actually Spanish soldiers. 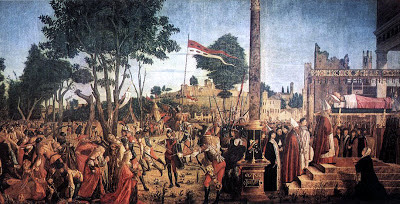 The painting is part of the passion cycle, but Majeweski reveals how Bruegel has politicized it, by depicting Christ's Roman persecutors as the occupying forces from Spain. 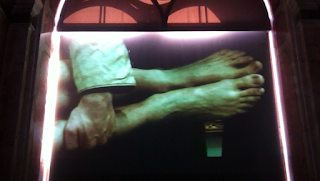 The exhibition at the Bourse Museum included three large video works in this same style, called the "Breugel Suite," which appeared earlier at the Louvres and the Venice Bienalle. There are also selections from three other video cycles made over the last ten years. 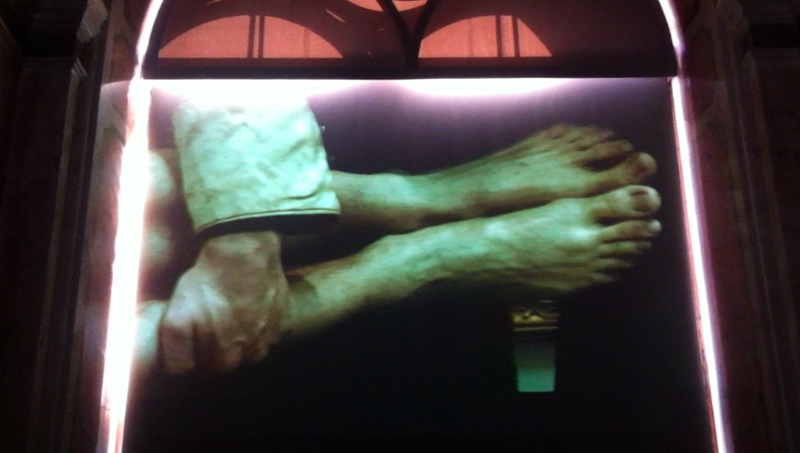 One screen shows a group of museum goer's reenacting Rogier van der Weyden's deposition. I was struck by the concept because the art historian, David Freedberg, has used this Rogier painting as an example when arguing that viewers are disposed to spontaneously imitate the actions and emotions depicted in artworks. I don't know if Majewski knew of Freedberg's work when he created the piece, but it is a remarkable coincidence, if not. 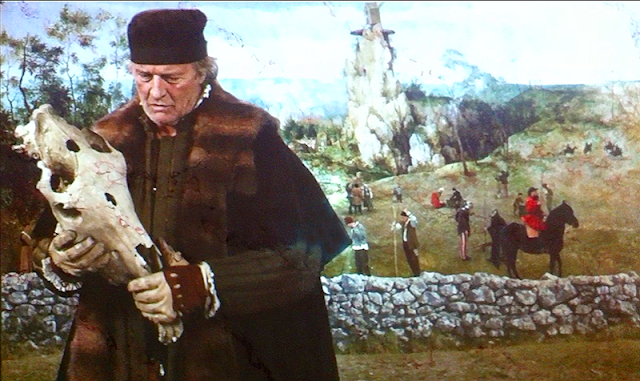 The piece also exemplified Majewski's affection for old northern masters. In a terrific interview at Arterritory (a Baltic/Slavic/Skandi art blog), he expresses contempt for contemporary art. Majewski's attitudes toward contemporary art are ironic, since nothing in more au courant than video art. Still, these works have a classic sensibility. This is a source of their strength, but they occasionally lack freshness as a result. All are expertly crafted. Most of the imagery is original and affecting, but there are occasional lapses. One showing a woman undressed in the woods and another showing a woman boxing on stage struck me as bit trite. Overall, however, the artist emerges as an undeniable virtuoso. A piece called The Roe's Room (last still below) is a visualization of an opera based on Majewski's autobiographical poetry. Majewski is nostalgic for a time when artists did everything. Nostalgia is a bit of a liability, but Majewski's best work uses cutting edge techniques to bring his Renaissance aesthetic into modern form. 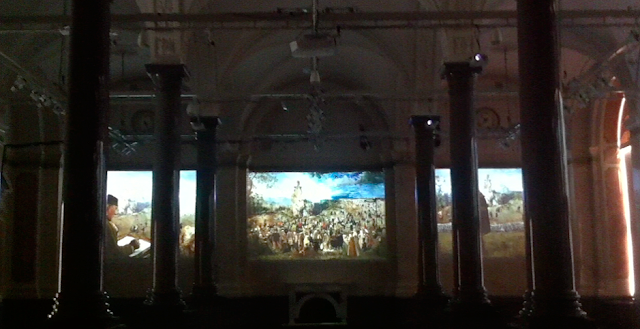 The Bourse Museum was a perfect setting for this work: an old interior updated. Of all the Venetian masters--including Bellini, Mantegna, Giorgione, Titian, Tintoretto--there is none I like more than Vittore Carpaccio. "Carpaccio?" you ask. No, not thin meat slices on a plate, but one of the major painters in Venice at the turn of the 16th century. Better known in Italy, Carpaccio remains something of an unsung hero in the Anglophone world, and, after a recent visit to some of his masterpieces, I'm delighted to sing his praises on artbouillon. Carpaccio is best-known for his grand multi-figure painting cycles. The two most important can seen in Venice. 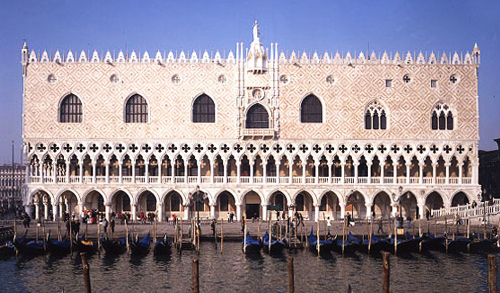 At the Accademia, visitors can find nine enormous canvases that tell the legend of St. Ursula. Daughter of the British king, Ursula took her new husband, a pagan convert to Christianity, on a pilgrimage to Rome. On returning, they and their fellow pilgrims, were massacred by the Huns, after Ursula refused the advances of the Hun leader. The paintings are lavishly detailed and almost formal to a fault. The three standouts are the panel showing Ursula meeting the Pope, Ursula's martyrdom and funeral, and a depiction of Ursula asleep, having a dream that portends her impending death. Each shows off a different aspect of Carpaccio's talent. 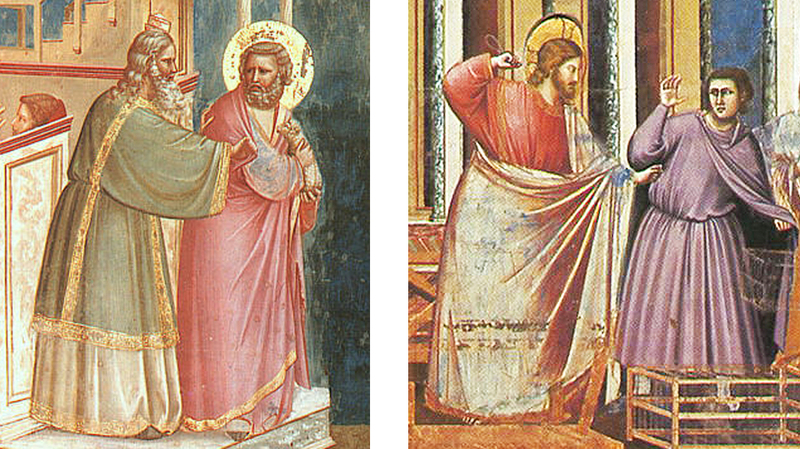 The Pope panel appeals in large part because of Carpaccio's use of visual repetition (right). He depicts a group of cardinals in conical hats, beneath raised banners, creating a visual pattern that is at once rhythmic and still. Another Carpaccio trademark, in the deeply recessed landscape. Carpaccio has an extraordinary sense of space. His characters often appear lines up at the front of expansive clearing with extraordinary architectural details and nature scenes in the distant background. The martyrdom and funeral panel shows a brutal massacre on the left, and a funeral on the right. 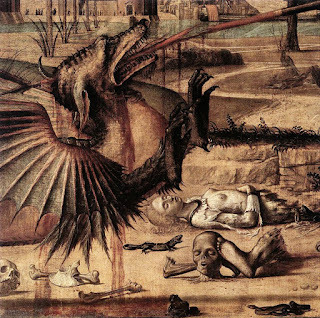 The massacre is brutal and grotesque, but retains Carpaccio's sense of stillness. Ursula kneels, statue-like, ready for the sword. My favorite panel is the dream. Another Carpaccio trademark is the empty chamber, with one or two figures. Ursula's still body is the visual echo of her position in the funeral panel, but the empty space her contrast sharply with the chaos of the martyrdom. 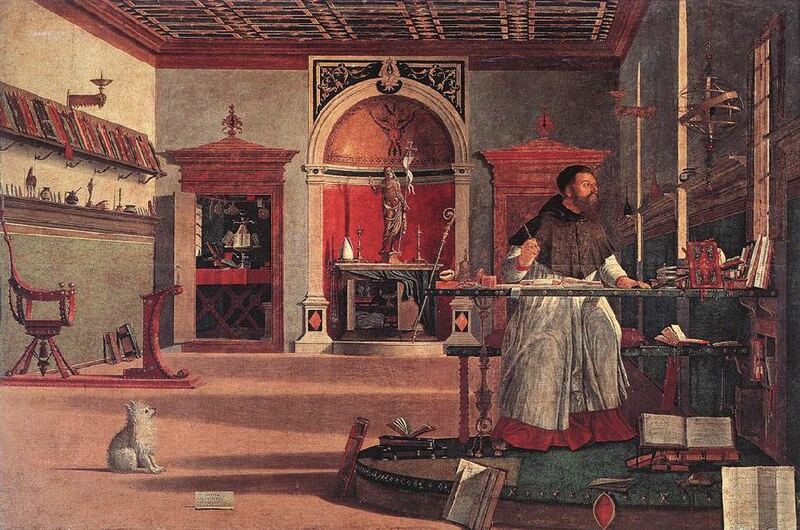 Carpaccio's use of empty space reminds me of Antonio, who famously used emptiness to great psychological effect. Here, in the serenity of the room, viewers are invited to fill the open areas with images of the coming violence. Violence is also a theme in another remarkable Carpaccio at the Accademia. 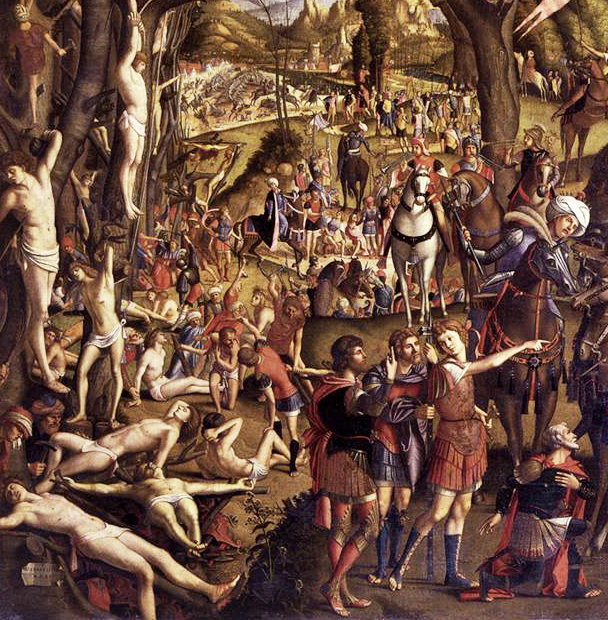 In his Ten Thousand Martyrs of Mount Ararat (below left), Capraccio depicts a ghastly scene, with an army of Roman soldiers on the ground, and trees strewn with dying bodies. Once again, the violence is presented with classical reserve, with rhythmic repetitions. Even more impressive than the Accademia paintings are those on display in the Scuola Di San Giorgio Degli Schiavoni. 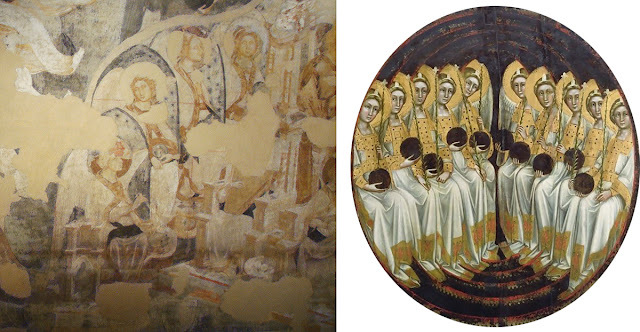 Here there are several cycles, lining the upper walls, depicting patron saints of the Scuola. 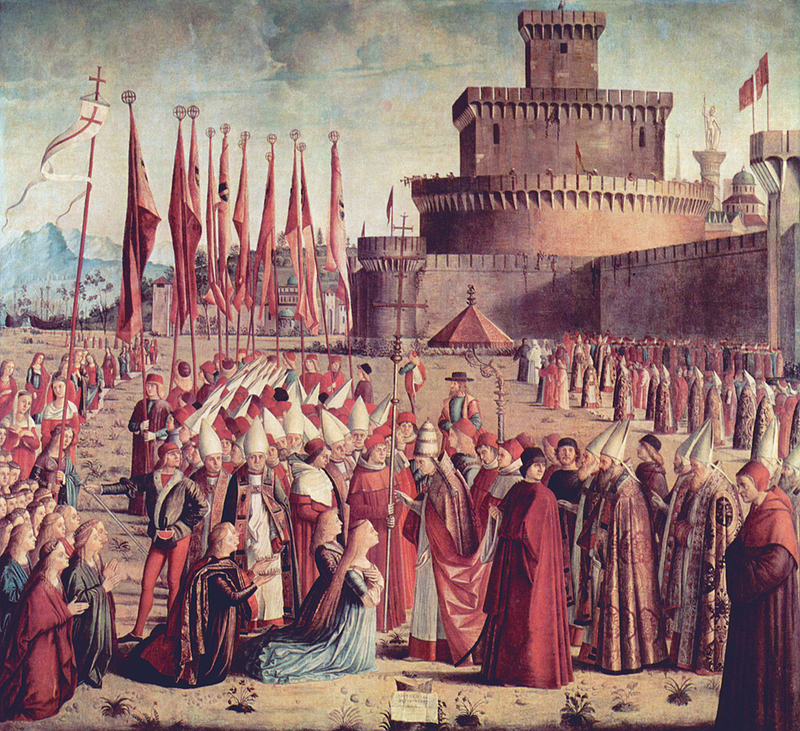 These are my favorite paintings by Carpaccio. On the west well, we find depictions of St. George. The panel depicting his conquest over the dragon illustrates, once more, the artist's tendency to present violent scenes with poetic stillness. George is on a leaping horse, driving a spear into the dragon's jaws, but the moment is completely frozen, and it is almost impossible to imaging the figures in motion. We also find repetition and opposition, the vile dragon is the mirror image of the noble horse. 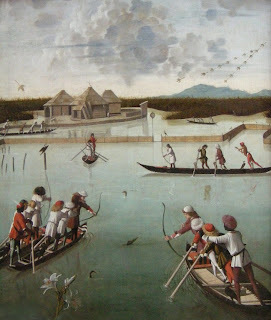 The landscape is classic Carpaccio: an open plain with fantasy architecture on the horizon. It is also a grizzly scene, strewn with the dismembered parts of the dragon's victims. Particularly poignant is the naked upper body of a bisected woman, whose final repose, above above a still life of body parts, looks more like a calm sleep. 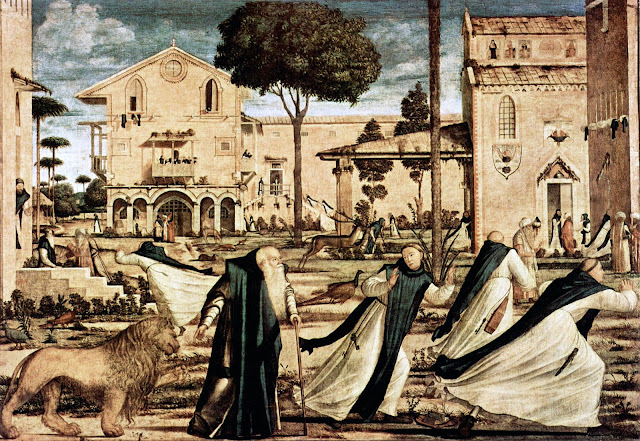 The east wall of the Scuola hosts my favorite of all Carpaccio's: St. Jerome and the Lion. While living as a hermit, Jerome tamed the savage beast by plucking a thorn from it's paw. Upon return, he presents his feline friend to his fellow monks, who scatter in terror. Visual repetition, dynamic stillness, and expansive space are all used to masterful effect here. 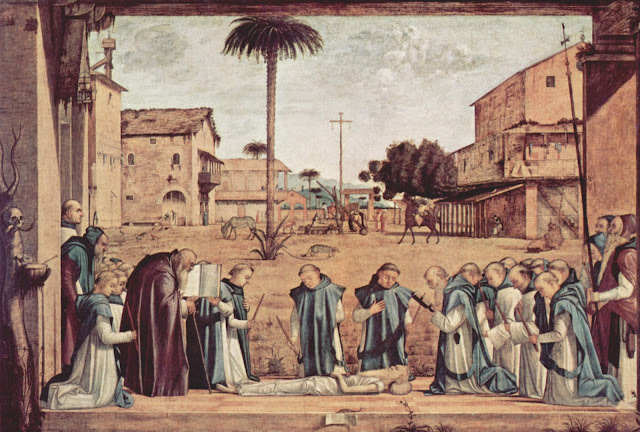 Also charming is the panel showing Jerome's burial: a trademark horizontal body flanked by columns of reverent monks, set against a deep background dotted with exotic trees. 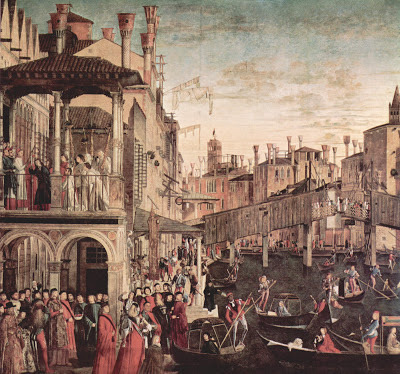 Carpaccio's most famous painting is also in Venice (below left), but at the Correr museum in the St. Marco complex. When I was visiting it had been temporarily relocated to another exhibition space, to be included, bizarrely in a Manet show. (That show's most exciting feature was a juxtaposition of Titian's Venus of Urbino and Manet's Olympia, which is bases on the Titian. Amazing to see these side by side.) The painting shows two ladies on a balcony, and it filled with subtle doublings: two vases, two doves, two birds with long tail feathers, two shoes, and two adorable dogs (one aggressive, one scared). Recent scholarship has revealed that this enigmatic work is actually the lower half of a long painting that was split. The upper register shows a hunting party (above right), and is owned by the Getty Museum. I combined them here to give an impression of the unified work. The two ladies are evidently waiting for the hunting husbands to come home. The combined work reveals this to be another exercise in pictorial depth. The receding landscape forecasts Yves Tanguy, and has a dreamlike quality that would be appreciated by the surrealists. 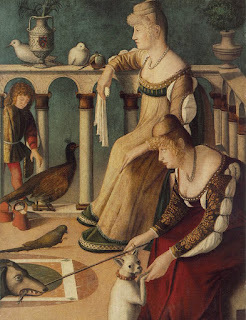 Animals are pervasive in Carpaccio's works. Dogs and birds make frequent cameos, and I have also mentioned Jerome's lion, and St. George with his horse and dragon. The grizzly detail from the St. George painting also includes a gaping lizard, a micro-reflection of the dragon above, gesturing, perhaps, at the ubiquity of evil. Below the lizard there is also a frog and a snake. 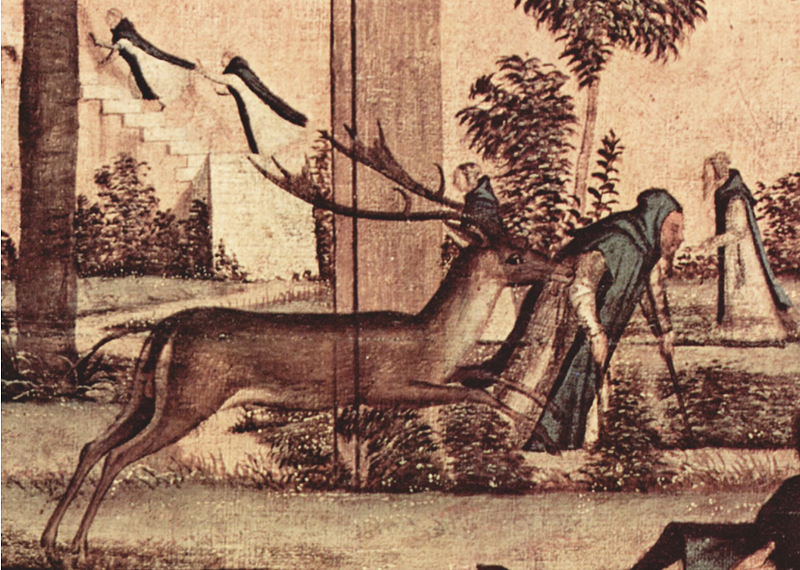 The Jerome paintings include a donkey, horses, deer, and an exotic creature with a long body and a tufted tail. One of the Ursula panels includes a peacock next to a monkey. Searching for these hidden critters adds a further layer of enjoyment to the work, and also reveal Carpaccio to be an observant naturalist. He also seems to be an animal lover. His dogs sometimes appear to be symbols of fidelity (for example, an elegant canine stands just below St. George in a panel showing his baptism), but sometimes they are mere companions. The Schiavoni Scuola has a magnificent portrait of Augustine. This geometric interior is compositionally similar to the one in Ursula's dream, but instead of an angel visiting the main figure, we find a little white dog. A similar dog also appears discretely in another celebrated Carpaccio painting: The Miracle of the True Cross, at the Accademia (top). 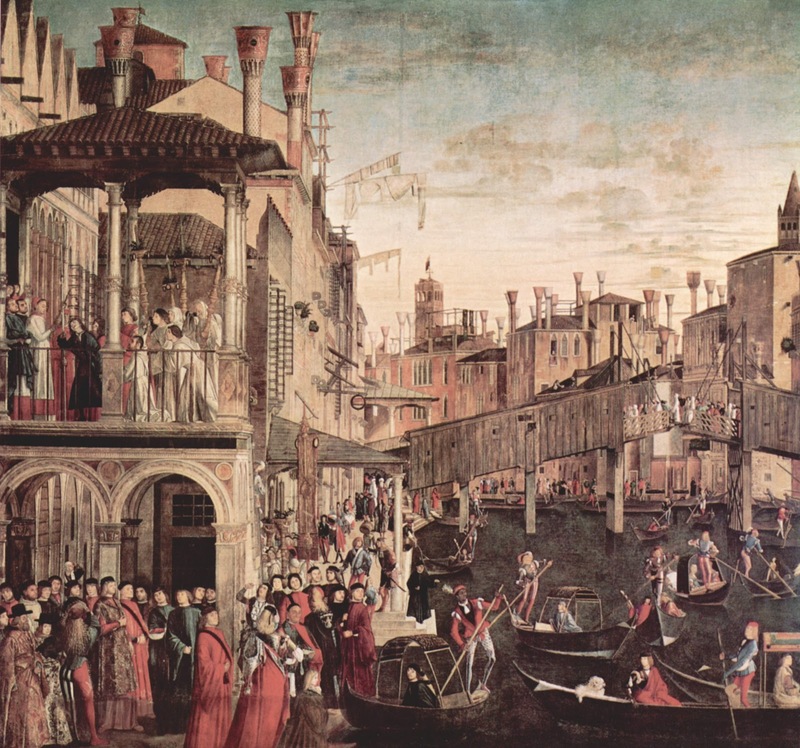 Ostensibly a painting of the old Rialto bridge in Venice, the titular miracle is presented inconspicuously in the upper right: a possessed monk is cured of his madness. 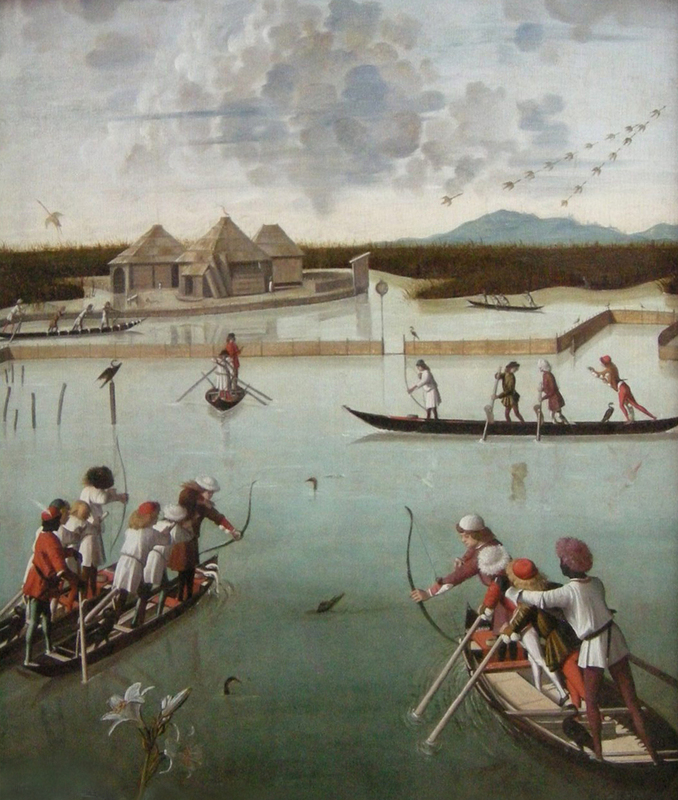 The left side shows gondolas in the grand canal, one of which contains the white dog. I will end with a final image, which lives, alas, not in Venice but in the spectacular Gameldegalerie in Berlin. 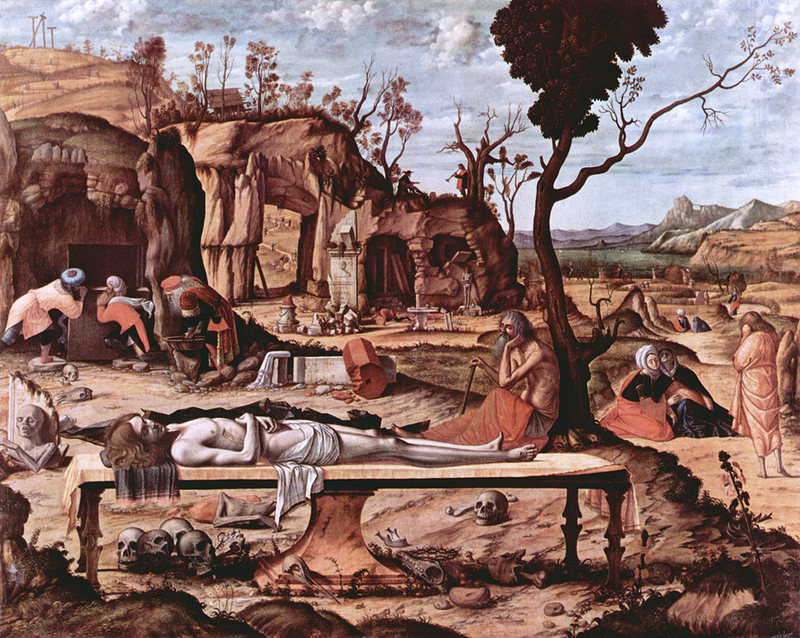 This is a lamentation of Christ, which embodies too of the features so striking in Carpaccio's work. First, there is the sense of space. This picture seems to stretch miles, with the main action lined up in the front, and then a layered succession of scenes receding into the picture plane: lamenting Marys, tomb guards in Ottoman regalia, musicians in a hill, ruins, and distant crosses. Second, we get Carpaccio's stillness: the outstretched Christ, the guards leaning on a stone tomb door, and the lamenters who lean against each other in sullen mourning, rather than flailing in despair. As with most of Carpaccio's paintings, the lines tend to be horizontal or vertical, creating grid-like composure, and there is a carefully contrived repetition of red accents, trees, and sculls, which give the picture a a rhythmic coherence. Carpaccio gives us a harmonious world, filled with endless details to explore. His paintings are not so much seen as entered, and, even when topically dark, one discoverers such profound comfort there, that those who enter will never want to leave. Among Venice's many treasures, few are more spectacular than Tintoretto's Paradise, which hangs in the Doge's Palace, next to San Marco's Cathedral. I saw it on a recent art pilgrimage. The painting was commissioned when Tintoretto was 70 years old, and was executed with the help of his son, Domenico (three of Tintoretto's children became painters, including his daughter, Marietta Robusti). The painting is a roaring sea of activity--far too detailed for the eyes to take in at once. 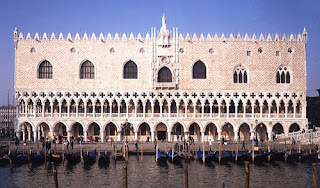 At 74 x 30 feet, it is about the size of a tennis court, and it spans a massive wall in a room that was once the seat of Venetian power. It would be Tinoretto's last masterpiece. 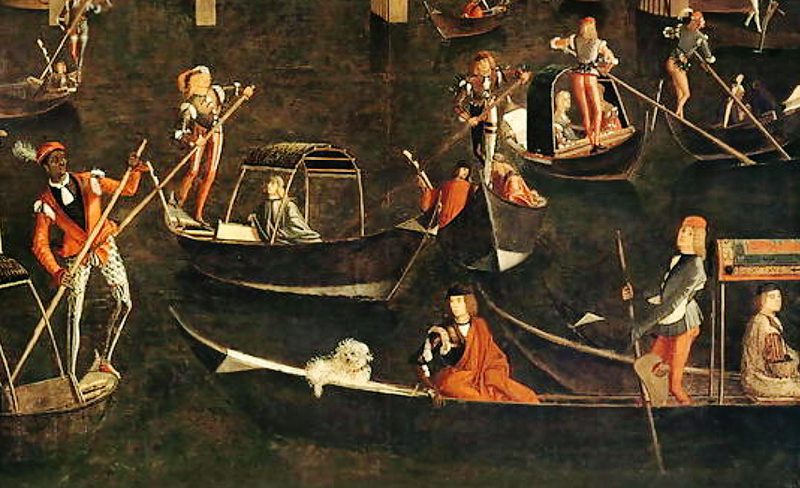 For a thousand years, Venice was ruled by elected Doge's (or "dukes"). In 1340, construction began on a Gothic palace, that would serve as a residence, a seat of government, and, in the lower chambers, a prison. No chamber in the palace was more important that the Great Council Hall, where up to 2,000 aristocrats would gather to legislate policy. 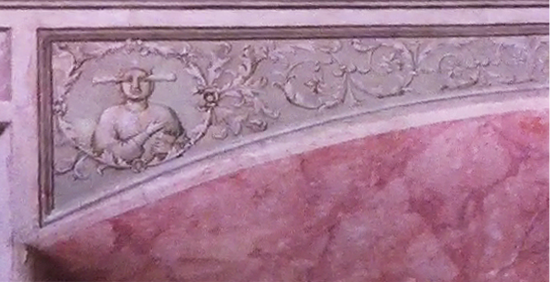 The room was originally decorated with frescoes by Guariento di Arpo, a trecento painter from Padua, but those were destroyed in a great fire in 1577. Below you can see a badly damaged detail of a Guariento fresco, on display at the Palace, as well as a detail from a well preserved work, showing the artist's impressive but decidedly Gothic style. After the fire, the Venetian government needed to rebuild the Great Council Hall, and they decided to hold a contest to selected a painted for it's walls. Tintoretto submitted a sketch, as did Veronese and Bassano, among others (those three sketches appear below in this order). The commission was originally granted to Veronese and Tintoretto, who were evidently expected to collaborate, despite their different styles. 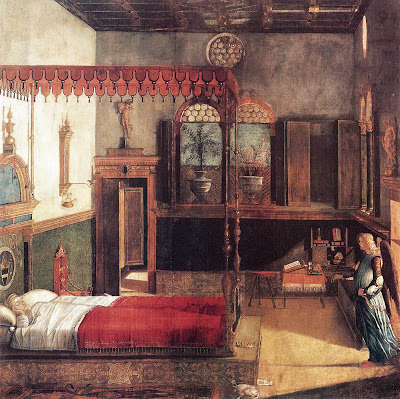 This plan changed when Veronese died in 1588. 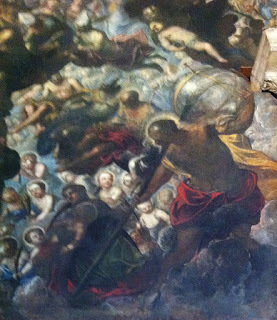 At that point, Tintoretto was given the commission. At that point, Tintoretto changed his original design, perhaps to catch up with prevailing trends in style, and he executed another sketch (below), which is currently under restoration at the Thyssen Museum in Madrid. The new design conveys the spirit of the final work, though with less grandeur. Tintoretto is perhaps the grandest of Venetian painters. When he submitted his first Paradise sketch , he was still completing his work for the Scuola Grande di San Rocco--two decades worth of mammoth paintings that remaining the crowing achievement of his career. Dark and imposing, these show of Tintoretto's talent as a dramatist. He breaks from compositional conventions to bring new energy to familiar subjects. His crucifixion, for example, has the familiar suspended Christ with mourners at its center, but the surrounding expanse is swarming with equestrian soldiers, and executioners who labor to erect the two other crosses that will eventually flank Christ's sides. The is not a painting of an temporally fixed occurrence, but of an unfolding event. One almost expects the scene to change after each glance away. Drama is certainly present in his Paradise painting as well, but it departs from his more canonical work in various ways. There is more color in his palette, less narrative, and the composition is decentralized. Above I called it a sea of activity, and this is more than a metaphor. The painting looks like a turbulent body of water, with dark blue waves and white crests. It resembles the seascapes created by some of the great ukiyo-e printmakers of Japan, like the one below by Utagawa Kuniyoshi. 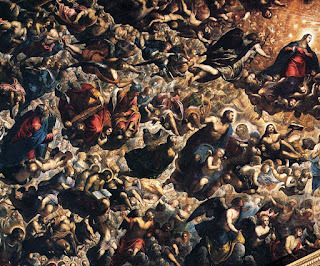 Tintoretto's sea is made of people. Even the white crests are filled with people. His earlier sketch for the painting was also punctuated by white forms, but these were clouds. The final version is astonishing in part because there is no negative space. Every inch of the surface teams with figures ascending into Paradise. These figures are layered on top of each other, with the highest layer occupied by winged angels hovering into the composition from all directions. At the center there is an ball of orange light, the gateway to heaven, but the rest of the painting seems almost devoid of orientation. There is no up or down, no sky or earth, no stable point on which to perch. 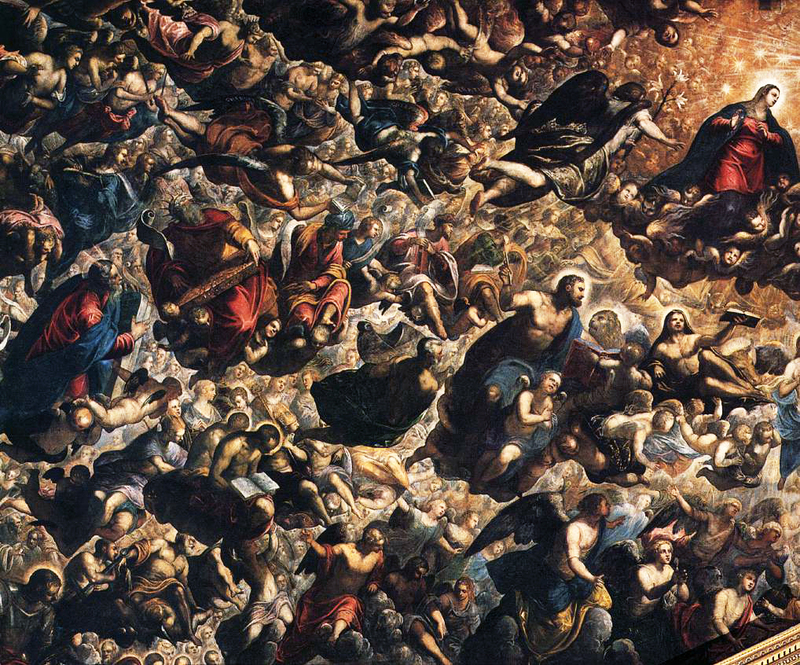 Tintoretto's Paradise is a crowded place. It would be suffocating were it not for the overall all sense of flow. Each individual body is part of a larger whole here. It is a paradise in which identity gives way to dynamic unity. One consequence of this unity is that it is difficult to discern the people in Tintoretto's painting. It might be the most figurative populous picture in the Western canon, but, paradoxically, the figures are almost invisible. They are a texture, forecasting Pollack's action paintings and other exercises in pure abstraction. To me, this is the what makes the work so compelling. It is painting whose whole is not only greater than its parts, but seems almost independent of those parts. When one focuses in on interlocked bodies from which it is constructed, one loses the larger visual design, and, when one steps back, those bodies magically disappear, and the grand canvas (perhaps the largest painting on canvas in history) breathes as one. No figure deserves greater credit than Giotto di Bondone, for ushering in the revolution in art that we now know as the Renaissance. 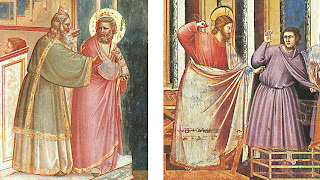 Though others, like Cimabue, had shifted from the constraints of Gothic art, Giotto introduced a degree of naturalism that had not been seen since the natural world. Naturalistic, yet not classical in sensibility. Greco-Roman art is marked by a kind of heroic theatrics, grotesque at times, and always idealized. These vulgar tendencies would eventually make their way into Renaissance art, but, for brief moment at its inception, Renaissance painting had a poetic calm, inherited from Gothic spiritualism. Giotto preserves that poetry, but translates the otherworldly focus into something movingly terrestrial. 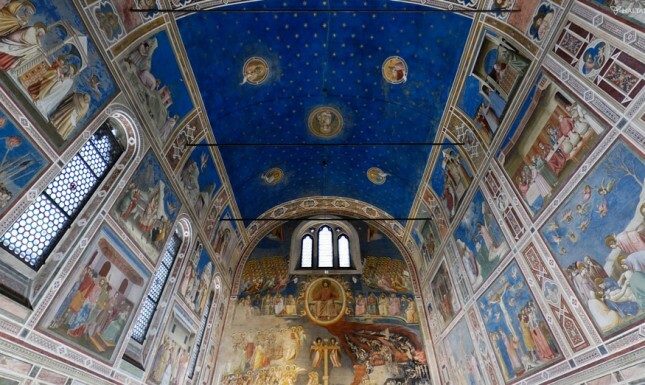 I recently had the great thrill of seeing Giotto’s masterpiece, the Scrovegni Chapel in Padua (known to art historians as the Arena, because a roman arena once stood on the same site). Enrico Scrovegni came from a money lending family, and allegedly built the chapel in order to compensate for the sin of usury, which might otherwise mean an eternity in hell. He commissioned Giotto to pain frescos covering all the interior walls of the chapel. The work, completed rapidly between 1305 and 1306, is one of the greatest masterpieces in the history of art. The two walls are divided into rectangular tableaus, depicting the life of Mary and of Jesus. Portraits of the two also appear on the ceiling, like two planets set against as starry blue, protecting parishioners like a heavenly mantel. 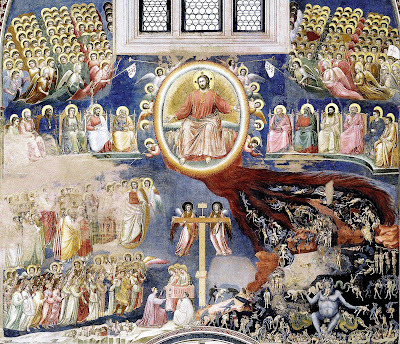 On the central rear wall of the chapel, we find Giotto’s piece de la resistance: the Last Judgment. At the threshold of Giotto’s hell, Giotto depicts his patron, Scrovegni, delivering the chapel as his gift of penance. Goitto’s hell is a remarkable place. It seems to pour out of a lava pool from the foot of an enthroned Christ figure, who looms with stiff majesty above flanks of angels. The lava pool is a tangle of tortured bodies set against a dark background. Some are strung up like drying meat, other lie limply, like rags, and still others writhe in pain. Interspersed among them, we find teams of gray-blue demons, who prod and torment the hapless naked damned. There is also a hanging Judas. Elsewhere in the cycle, Judas appears, hook nosed, receiving a payoff for betrayal, with a shadowy demon coaxing him on. At the center of Giotto’s hell, we find an enormous and imposing Satan, one of the greatest monster’s in western art. 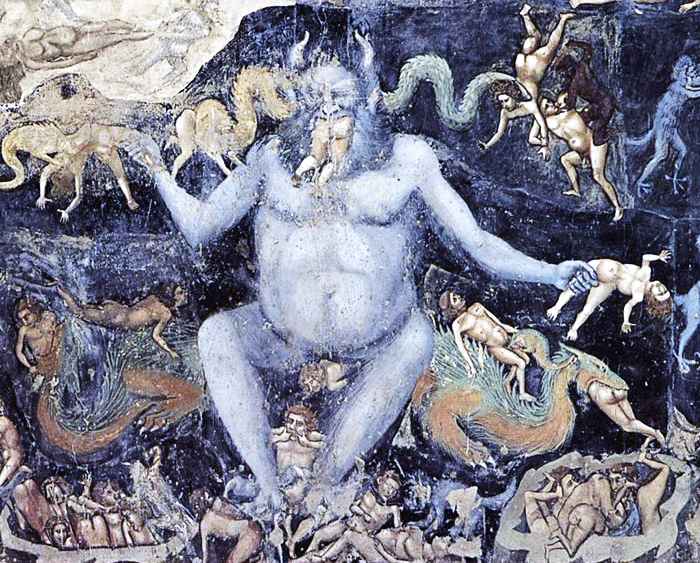 Giotto’s Satan is a portly slate blue figure, with furry jowls and twisting horns. He is perched on a man-eating dragon, his feet are crushing other a cluster of bodies, and each outstretched hand holds another body. Most disturbingly, the lower half of a human body dangles from Satan’s mouth, forecasting Goya’s infamous black painting of Saturn Devouring his Son. Giotto’s This Satan is king of cannibals, an unmovable mountain of cruelty whose round belly practically pulsates with the girth of previous fleshy meals. 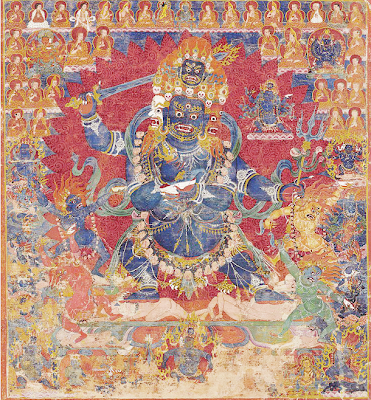 Curiously, Giotto’s Satan also bears a striking resemblance to the Mahakalas of Tibetan art. The one reproduced below was recently auctioned at Christie's. Mahakala is a protector. Placed in a home or a monastery, he would protect his owners, by absorbing and deflecting evil forces. Given the resemblance, one wonders whether Giotto had seen such images, or whether an influential Tibetan painter had made a field trip to Padua. In any case, the Tibetan works invite a kind of Gestalt shift. 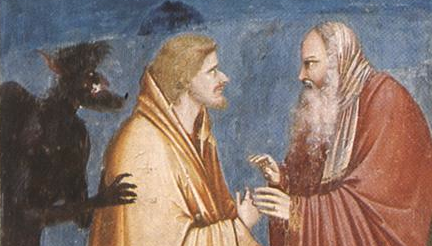 For all his ravenous menace, it is hard not to see Giotto’s Satan as a positive presence. He serves as a warning for believers, and thus has a didactic function that can be regarded as positive. But he also functions as an artistic domestication of evil. By depicting Satan so compellingly, as the visual epicenter of the Arena frescos, Giotto has converted evil into an enchanting mythic beast. This is a fairly tale Satan, part of a gripping moral tale, but far from charmless. Indeed, Satan’s posture echoes the enthroned Christ, but he steels the show. Echoes, incidentally, are a fundamental feature to Giotto’s Arena. There are multiple points of compositional and narrative parallelism. Some examples are reproduced above. There are two panels with seated figures, two panels with figures on horseback, two sloping mountains with a tree, two mobs with spears, two hangings, two sacrifices (Joachim’s and Christ on the Cross), two babies in bed, two expulsions, two resurrections, two gaping holes (heaven and hell), two kisses, and two annunciations, and two figures bearing the chests. One these two figures is Caiphas, who condemns Christ, and in that very moment rends his clothes to expresses contempt. The other figure is the female personification of anger, one of the seven deadly sins. Giotto’s seven sins are unconventional. Anger is standardly included on lists of sins, and Giotto also has one other conventional sins: Envy. But his list also includes Injustice, Inconstancy, Infidelity, Folly, and Despair. Missing are Avarice, Gluttony, Lust, Pride, and Sloth. 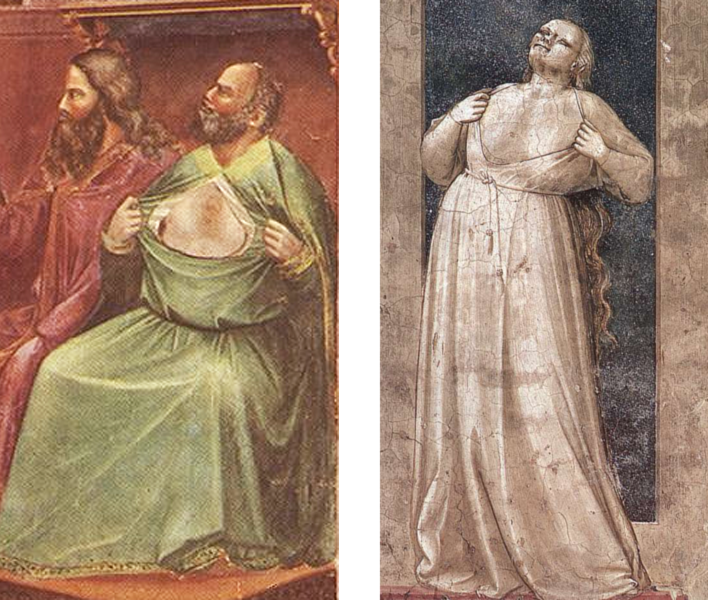 Giotto’s omissions relate to his principle of parallelism: he depicts seven virtues. 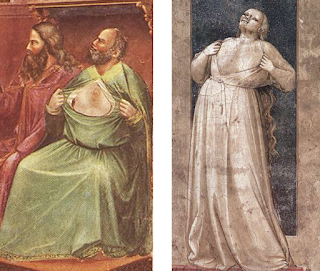 But it is hard to resist the idea that there is something editorial going on here, as my colleague Doug Lackey argues in a wonderful paper, “Giotto in Padua: A New Geography of the Human Soul.” By removing Lust and Gluttony, Giotto distances himself from asceticism. By including Folly, he denounce blind faith, an attitude that also comes through in a small cartoon of a person with sticks for eyes, painted nearby the Folly figure discreetly above the Chapel’s side door (so discrete, in fact, that I didn't find her until I made a second visit). 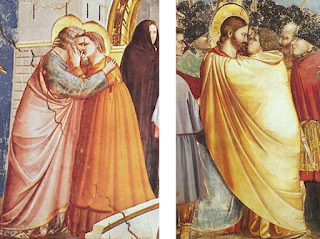 The omission of Pride raises questions about Giotto’s own ego (he may have recognized the magnitude of his own artistic achievement), but it may also reflect the emerging humanism at the dawn of the 14th century. 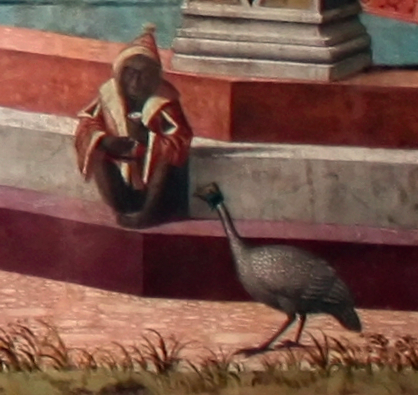 Giotto implicitly invites viewers to take pride in human accomplishments. Perhaps most touching is his inclusion of Despair among the sins, and its counterpart, Hope, among the virtues. As someone who is deservedly regarded as the first Renaissance painter, it is fitting that Giotto advocates a positive outlook on life. This brings us back to Giotto’s hell. Fire and brimstone theories promote fear, and one might expect a similar mood to pervade a chapel whose central panel depicts the Last Judgment. It is also believed to have been a funerary chapel, because of its barrel roof. But Giotto resists that sentiment. Unlike some of his Flemish counterparts who paint hell with terrifying relish, Giotto’s hell is more positively contextualized in the twilight blue of the Arena. It is one option for humankind, but also a place of myth and legend. The chapel itself embodies another option: beauty, creativity, and a celebration of human life.